Please note that all nominations from 2018 will be reviewed in 2019. Since 2007, Kwantlen Polytechnic University Alumni Association and KPU have recognized many deserving KPU alumni through the Alumni Awards Program. Kwantlen Polytechnic University alumni, students, employees, faculty, and members of the community are invited to nominate candidates who may have demonstrated excellence in their respective fields. The purpose of these awards is to recognize KPU Alumni who have enhanced the reputation of the university through their outstanding career, public service, community service, athletic, arts and culture, or academic achievements. Professional, business or industry –in professional or career endeavours. These achievements include, but are not limited to fields of business, social services, sciences, or the professions. Arts and culture –in the fine, performing or applied arts. Athletics –accomplishments in and/or service toward professional or amateur sport. Public service –in the field of public administration and policy development or service in elected or appointed positions at local, provincial, national or international levels. Community Service –service and/or contributions to the welfare and advancement of local, national or international communities. Academics – in the field of education, including research, teaching, program development and/or educational administration. Nominees must be aware of the nomination and sign the nomination form, accepting that their name, photo and credentials may be published in various media prior to and after the event. Recognizes KPU alumni demonstrating excellence in one or more of the following areas - Professional, Arts and Culture, Athletics, Public Service, Community and/or Volunteer Service, Academics and/or Research, Entrepreneurial or Innovation, Applied Technology, or Exemplified resilience in the face of adversity. Significant contributions on a regional, national, or international level would also be considered. Recognizes KPU alumni who are under 30 years old at the time of nomination. Have demonstrated excellence professionally and/or through community service. Involvement with KPU or alumni activities since graduation will be considered an asset. Recognizes future KPU Alumni who are KPU students at the time of applications. Have demonstrated excellence through education/service at KPU or in the community. Awards in each category may not be granted every year. 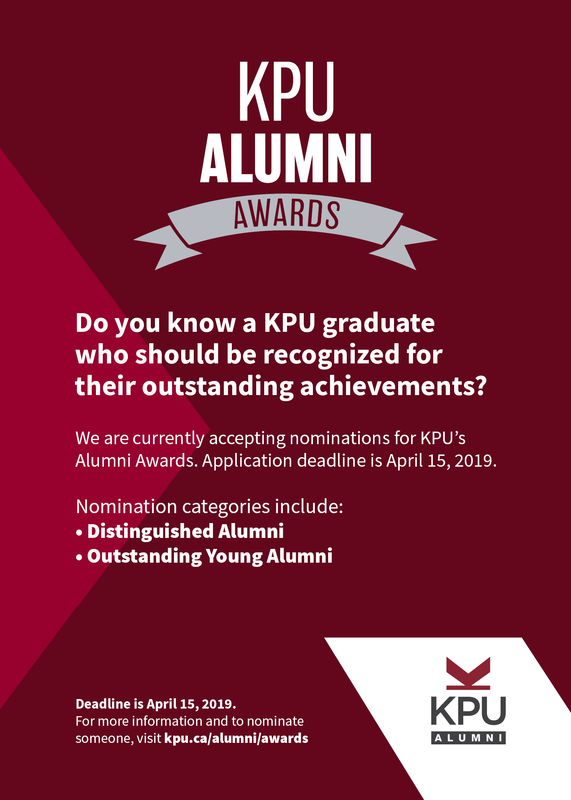 The KPU Alumni Association will qualify the number of recipients for the awards each year.